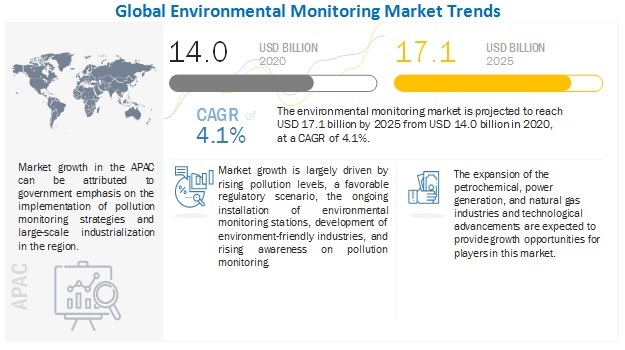 [172 pages Report] The global environmental monitoring market is estimated to reach USD 19.56 Billion by 2021, growing at a CAGR of 7.7% during the forecast period. Increasing government initiatives to control environmental pollution levels, increasing government funding for pollution control and monitoring, ongoing installations of environment monitoring stations, and growing initiatives for the development of environment-friendly industries are some key factors driving the growth of the global market. Furthermore, emerging markets such as Japan, China, and India offer new growth opportunities for market players. However, factors such as high product costs associated with environment monitoring solutions, slow implementation of pollution control reforms, and high export barriers on environmental technologies across emerging countries are restraining the market growth. The Asia-Pacific market is projected to grow at the highest CAGR of 10.0% during the forecast period. Increasing industrialization in Asia-Pacific countries (such as China and India), implementation of increasingly stringent environmental regulation policies, and the growing need to comply with various environmental safety regulations are the key factors propelling the demand for Environmental Monitoring products in emerging nations. In order to leverage the high growth opportunities in these emerging nations, leading market players are expanding their presence in these countries. As of 2015, Agilent Technologies, Inc. (U.S.) held the leading position in the global market. Over the past three years, the company has adopted new product launches, product enhancements, and collaborations as its key business strategies to ensure its dominance in this market. Danaher Corporation (U.S.), Honeywell International Inc. (U.S.), Siemens AG (Germany), Thermo Fisher Scientific Inc. (U.S.), TE Connectivity Ltd. (Switzerland), General Electric Company (U.S.), Emerson Electric Co. (U.S.), Teledyne Technologies Inc. (U.S.), and Merck KGaA (Germany) are some of the other key players in this market. The global environmental monitoring market is expected to reach USD 19.56 Billion by 2021, growing at a CAGR of 7.7% during the forecast period. Factors such as increasing government initiatives to control environmental pollution levels, increasing government funding for pollution control and monitoring, ongoing installations of environment monitoring stations, and growing initiatives for the development of environment-friendly industries are driving the growth of the global market. However, factors such as high product costs associated with environment monitoring solutions, slow implementation of pollution control reforms, and high export barriers on environmental technologies across emerging countries are some of the major factors restraining the growth of this market. In addition to this, uncertain and inconsistent environmental regulations across emerging countries are challenging the growth of this market. On the basis of product, the global environmental monitoring market is divided into three major categories, namely, environmental monitors, environmental sensors, and environmental monitoring software. The environmental monitor is further divided into two monitoring product segments, namely, fixed monitors and portable monitors. The environmental sensors segment is further divided on the basis of product architecture (analog sensors, and digital sensors) and on the basis of applications (temperature sensing, moisture detection, chemical detection, biological detection, particulate detection, and noise measurement). The portable monitors segment is expected to grow at the highest CAGR in the next five years, owing to the increase in the adoption of smart homes and modern building designs as well as continuous development of innovative environmental monitoring technologies for pollution monitoring and control. On the basis of region, this market is classified into North America, Europe, Asia-Pacific, and the Rest of the World. In 2016, the global environmental monitoring market is expected to be dominated by North America. Increasing government funding for the maintenance and operation of environmental monitoring stations and the stringent regulations of the U.S. ssEnvironmental Protection Agency (U.S. EPA) are driving the growth of the market in the North American region. The Asia-Pacific market is expected to grow at the highest CAGR during the forecast period. This is primarily due to rapid industrialization, implementation of increasingly stringent environmental regulation policies, and the growing need to comply with various environmental safety regulations. The environmental monitoring industry is an attractive market for new entrants owing to the significant growth potential offered and high return-on-investment for innovative pollution monitoring products. A majority of the key players in the market are following the product development and enhancement strategy. This strategy helps the players to develop innovative, affordable, and portable air and water pollution monitoring products, strengthen their R&D base and distribution networks, and expand into fast-growing emerging nations in Asia-Pacific. This strategy also enables market players to meet the growing demand of the consumers. Figure 33 Company Snapshot: Agilent Technologies, Inc. Figure 35 Company Snapshot: Honeywell International Inc. Figure 37 Company Snapshot: Thermo Fisher Scientific Inc. Figure 38 Company Snapshot: TE Connectivity Ltd. Figure 40 Company Snapshot: Emerson Electric Co.